Find artworks, auction results, sale prices and pictures of Josef Müller-Brockmann at auctions worldwide. Josef Müller-Brockmann - Stadttheater Zürich / The New York City Ballet. 1962. STADTTHEATER ZÜRICH / THE NEW YORK CITY BALLET. 1962. 50x36 inches 127x91 1/2 cm. Müller-Brockmann, Zurich. Condition B+: minor scratches, abrasions and losses in text at top. are lauded as icons of the rigorous Swiss approach to graphic design. Here, for a performance by the New York City Ballet in Switzerland, he exemplifies his objective approach to photography. 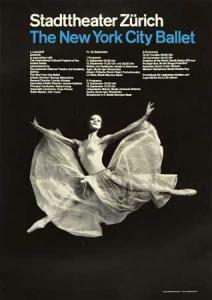 The ballerina, in the midst of a graceful leap, is well positioned against the black background, and the typography is rigorous. It is a silk-screened image on black paper. Muller-Brockman 168, Theatreplakate 374.